One typical feature of Thai cuisine is the subtle blending of the four basic tastes groups: sweet, sour, salty and bitter. Many Thai dishes are described by their combination of the four, so a recipe may be sour-sweet or bitter-salty. Thai food uses a great deal of garlic, chilli and fresh fragrant herbs such as lemongrass which delivers both taste and a distinctive sweet aroma. For feasts and celebrations, Thai cuisine often sets out the food in beautifully carved fruit and vegetables. These symbolise elegance and artistry and are designed to show the respect of the hosts for their guests by making each meal a unique experience of taste, aroma and visual pleasure. This carving can be incredibly elaborate, but you can make simple designs yourself that have high impact on the dining table. Wash the radish and cut the stem end so that the radish will stand upright. At the pointed tip, use a very sharp knife to make four grooves that taper at each end to form a petal shape. Within each of these petals, make a vee shaped cut to create another petal – ensure that this vee shape meets in the centre of the cut so that the section of radish can be removed. Now put the radish in iced water so that the outer petals open out. Add a few drops of lime juice to the iced water to stop the radish browning. 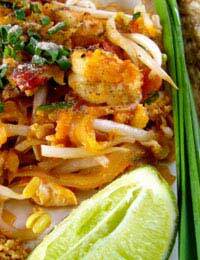 Thai food has a large number of famous dishes, but three of the most famous are Pad Thai, sticky rice and satay. This dish is a stir-fried blend of noodles, tofu, bean sprouts and egg. It is classed s sweet-sour-salty and offers a wide range of textures to please the palate of the diner. As with many Thai dishes, there are ingredients that can be varied according to season and market availability. This recipe is made using pork, but you could choose chicken or tofu instead. Put the noodles in a large bowl. Boil a kettle of water and pour it over them. Leave to soak for twenty minutes and then drain through a colander. Heat the peanut oil in a wok and add the garlic and pork. Fry until the meat browns and then add the noodles, seafood, fish sauce, sugar, lime juice and bean sprouts. Stir fry for another four to five minutes making sure the ingredients are well mixed and heated. Now add the peanuts and toss the dish to allow them to mix into the rest of the ingredients. Serve on an attractive plate, garnished with coriander and lime wedges. Sticky or glutinous rice has been eaten in Asia for centuries. It can only be made with special rice, ordinary short grain won’t produce the right stickiness. Perfect sticky rice needs overnight preparation. The rice must be rinsed in cold water until it runs clear and then left in a bowl, covered with water, overnight. The next day, drain the rice in a sieve and if possible, wrap in cheesecloth. If not, put in a bamboo steamer without the cloth. Steam over boiling water for 45 minutes. Leave to stand for five minutes and then turn out onto a clean work surface, turning it over with a wooden spatula until it forms a ball or mound. Place on a platter, allowing your diners to scoop off a ball and shape it into a handful to dip into sauce. Satay is a cooking technique, rather than a recipe. It simply means threading something on a skewer and grilling it. Traditionally, satay was either beef or chicken, but recently pork and king prawns have become popular satay ingredients, as has tofu, which – in its firm form – can be threaded onto skewers like meat. Satay is traditionally served with a sweet-sour peanut sauce.